• An exclusive video welcome to the enhanced edition from Markus Zusak. 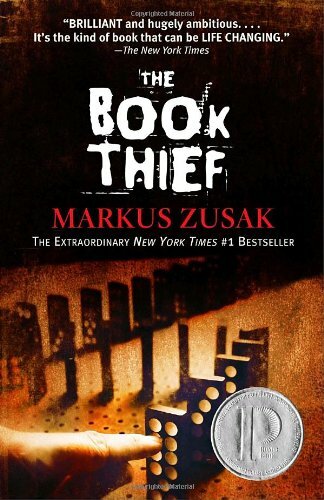 • The official movie trailer for The Book Thief. • Videos featurettes introducing Sophie Nélisse (Leisel Meminger) and Geoffrey Rush (Hans Hubermann) and their roles in the film. • Clips from the film embedded in the original text. • A video interview with Markus Zusak. toma (Grade: B) A unique, somber tale that brings a lot more to the table than just the Book Thief herself. Through the eyes of a young girl, and of Death itself, we are shown how the Nazi dictatorship spread through Germany steadily and how it began to affect everyone's lives in different ways. The writing style is quirky, but certainly not mediocre. I found the personalities of each person were made obvious right from their introduction. A recommended book, which is a future classic in the making. RemusLupin (Grade: A) The beginning was a bit slow to get into the story, but then I was hooked. Very unique premise and narration style, compelling characters, and impactful, unexpected conclusion. TheRaven42 (Grade: A) This is one heartwrenching, beautiful book. It's been a while since a book made me cry this much. I feel it taught me a lot about compassion and it gave yet new insights into the horrors of World War II. DoubleCMahoney (Grade: A+) My favorite book of all time. Amazingly unique point of view and narrative style. I thought it was very deep, but some think it is a bit trite at times. lalareads (Grade: A+) I am beyond grateful to have finally read such a unique and beautiful novel. All of the characters seem like flesh and blood captured on the page, and I feel like I know them. I believe The Book Thief is the epitome of a modern classic not only for its depiction of the persecution of the Jews and the lives of the German citizens, but for being uplifting and utterly devastating at the same time. As I read, my heart soared and broke so many times.